Print your logo onto these custom printed corporate lollipops or one of our other innovative lollipops and use them in your next marketing campaign as a unique giveaway item. Corporate Lollipops come in you company colour and individually cello wrapped. Choose from 6 great colours and flavours - Red (Strawberry), Yellow (Lemon), Blue (Tutti Frutti), Green (Lemon), Orange (Orange), Purple (Grape). Lollipops sold per unit. Decoration options include 19mm or 32mm diameter label applied to cello bag, 4cp double sided flag label folded onto stick or a 4cp business card attached to lollipop stick. 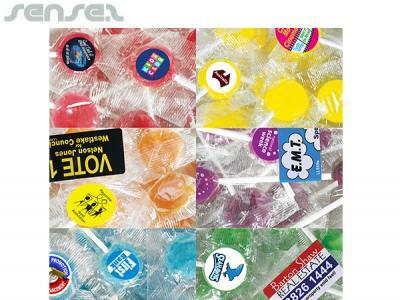 Custom brand these lollipops or one of our best-selling promotional confectionery & lollies»lollipops with your company logo! 4 colour process print is like a photographic print, where you can see a lot of detail and shading as part of your design. When we print your promotional corporate lollipops in full colour process we usually do this as a digital print. The colour match is quite good but is never quite such a perfect PMS colour match as is achieved by silkscreen print. Personalise your corporate lollipops or custom design lollipops for your marketing campaign. How can these unique promotional corporate lollipops or our personalised lollipops fit in with your marketing strategy and help you maximise your brand exposure? Our custom made Corporate Lollipops can be produced from a minimum quantity of 1000 pieces. We can have your logo branded on these corporate Corporate Lollipops in 4 Colour Process Print. A setup fee of AU$160.00 will apply to make the film.